Distance To Spot Ratio: 24:1. Contact Temperature Range (Celsius): -30 to 650 deg C.
Contact Temperature Range (Fahrenheit): -22 to 1202 deg F.
Take non-contact surface temperature measurements with IR (infrared) sensor. Measure smaller targets from a safer distance. Easily identify measurement location with built-in laser targeting. Graphical menu structure allows easy access to settings. Easy emissivity selection with predetermined levels and custom adjustment. Stunning visual high and low alarms. Rugged, industrial design that can withstand a three meter drop. Bright work light to help you see your target in poor lighting conditions. Continuous Run Time: 8 hrs Max. Auto Power Off: Yes with pre-set adjustment level and disable option. The Product once sold will not be returned. Flir TG54-NIST Spot IR Thermometer with NIST, Distance To Spot Ratio: 24:1 is a premium quality IR Thermometers from Flir. Moglix is a well-known ecommerce platform for qualitative range of IR Thermometers. All Flir TG54-NIST Spot IR Thermometer with NIST, Distance To Spot Ratio: 24:1 are manufactured by using quality assured material and advanced techniques, which make them up to the standard in this highly challenging field. The materials utilized to manufacture Flir TG54-NIST Spot IR Thermometer with NIST, Distance To Spot Ratio: 24:1, are sourced from the most reliable and official IR Thermometers vendors, chosen after performing detailed market surveys. Thus, Flir products are widely acknowledged in the market for their high quality. 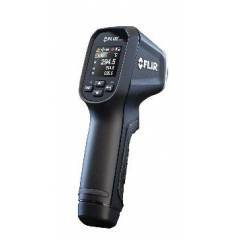 We are dedicatedly involved in providing an excellent quality array of Flir IR Thermometers.